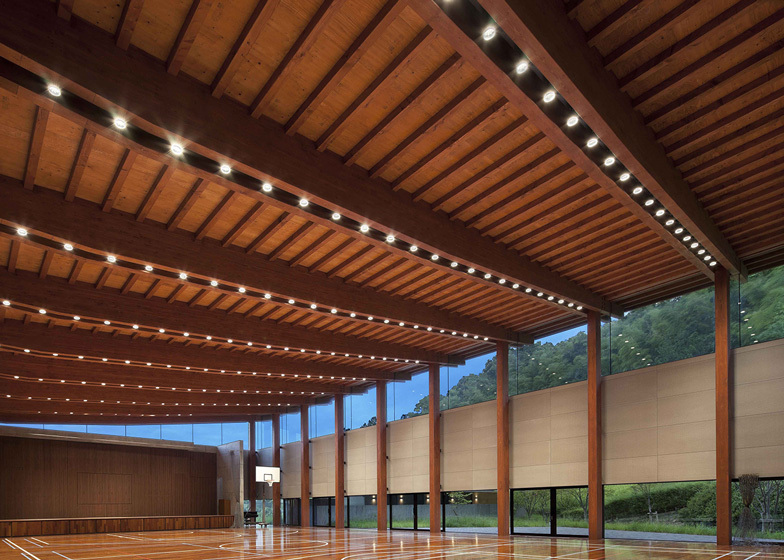 Huge clerestory windows reveal the exposed timber frame of this school sports hall in Kobe, Japan, by architecture firm Takenaka Corporation (+ slideshow). Entitled Harmonie Hall, the building functions as both a basketball court and auditorium for the Kobe International Junior High School and Senior High School, and was designed by Takenaka Corporation to fit in with the wood and concrete buildings that already made up the campus. "This building is designed to capture the most from the rich surrounding environment while inheriting the formal language of the campus as it exists today," says the architect. 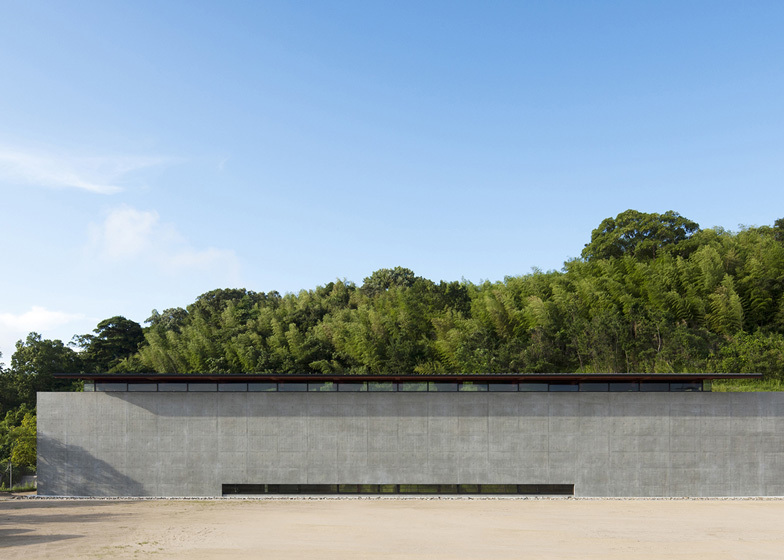 A 46 metre-long wall of uninterrupted concrete lines the north elevation. Narrow lengths of glazing run along its top and bottom, bringing light through to the floor and ceiling of the hall. Larger windows span the southern elevation so that students elsewhere on the campus can catch a glimpse of activities taking place inside, while students inside can look out towards the surrounding woodland. 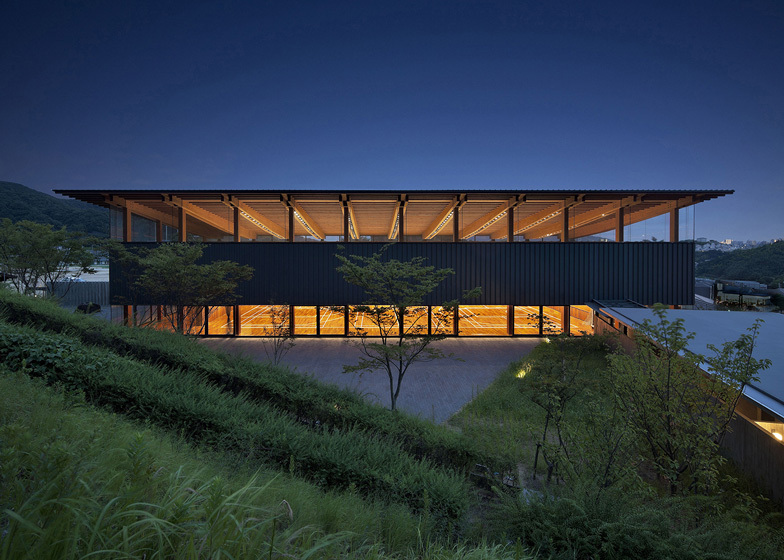 "Through the framing of landscape views, the beautiful surroundings engage with the space and offer openness by using the trees and sky to highlight the structural frame," explains the architect. 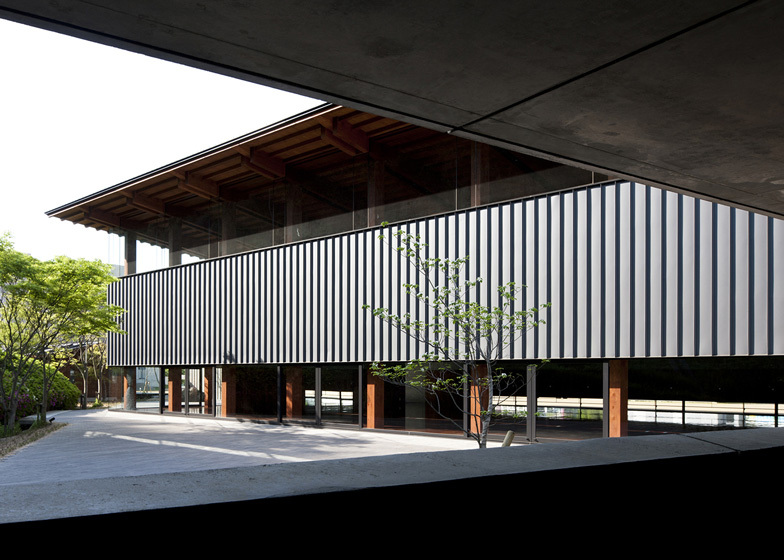 Structural timber columns are positioned along this facade to take some of the vertical load from the wooden roof, which protrudes over the edges of the walls. Toilets, storage areas and a teacher's office occupy a small annex with a connecting corridor. Other sports halls we've featured on Dezeen include one with bright yellow spectator stands and one with a fluorescent facade. Photography is by Tomoki Hahakura, apart from where otherwise indicated. The Kobe International Junior High School and Senior High School Harmonie Hall was based on an idea of a clear and open axial plan utilising concrete and wood to respond to the campus' history while creating a new relationship with the natural landscape. Harmonie Hall is an ancillary facility that includes a teacher's room, storage, toilets, and a gymnasium that can be used as both a basketball court and an auditorium. This building is designed to capture the most from the rich surrounding environment while inheriting the formal language of the campus as it exists today. Functionally, gyms tend to be enclosed spaces removed from their surrounding environment, but this time, by utilising a wood structural frame, the building is in concert with the vibrant local environment as much as possible. 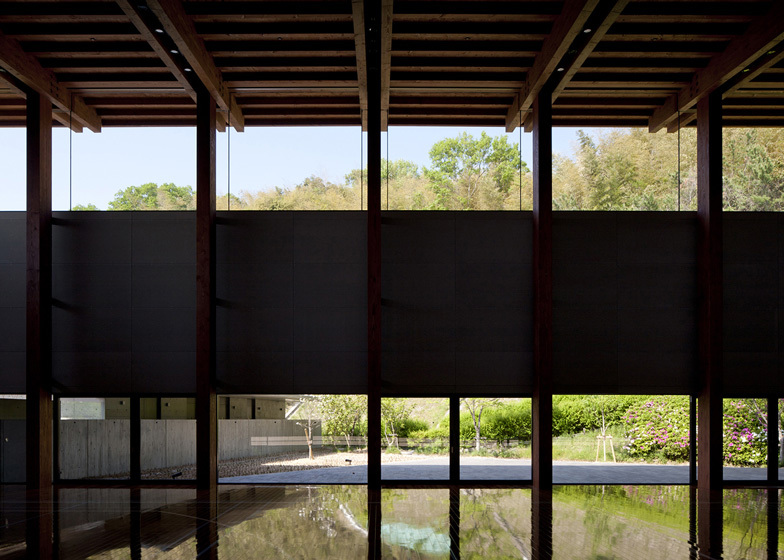 The south side leads to an existing building and is comprised of a long 20m wood structural span for views of the woodlands supported by a 6m high and 46m long concrete wall. Opening the building to the lush ecosystem of the north campus was a natural configuration. By supporting the horizontal force with concrete walls on three sides, with the north side being the exception, the structural roof frame was designed to transfer vertical load to the wooden poles on the north facade. The north side is a rich and open ecosystem. 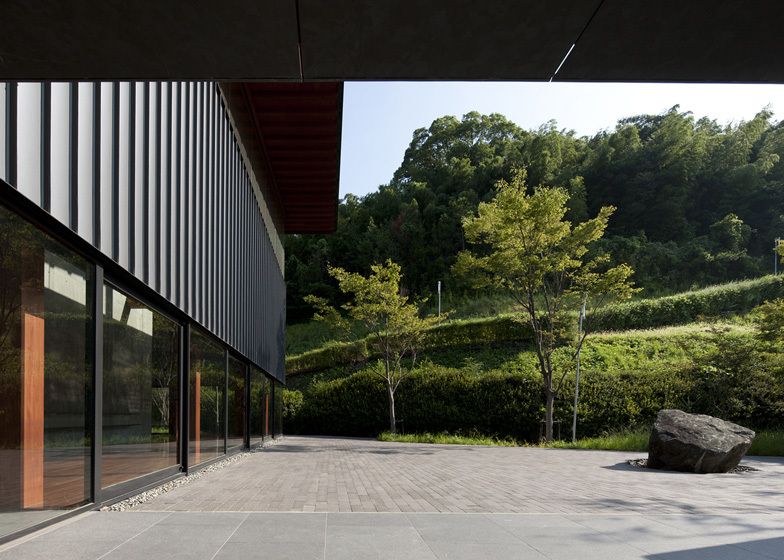 Through the framing of landscape views, the beautiful surroundings engage with the space and offer openness by using the trees and sky to highlight the structural frame. From the beginning, the design has been interested in offering the experience of simultaneous continuity between the paired horizontal open spaces. Furthermore, by providing a sufficient aperture to the wind and natural landscape, a space filled with light and consistent breezes from the north is realised. Also, by using vegetation identified from research and field surveys, trees are transplanted from the construction staging areas while simultaneously cultivating local seeds as a means to visually and biologically produce a landscape of continuity with the local context. ￼The idea for using structure to maximise openness to the surrounding environment, both conceptually and visually, marries the wind and light of the natural environment with the new space. The environment is the architecture. 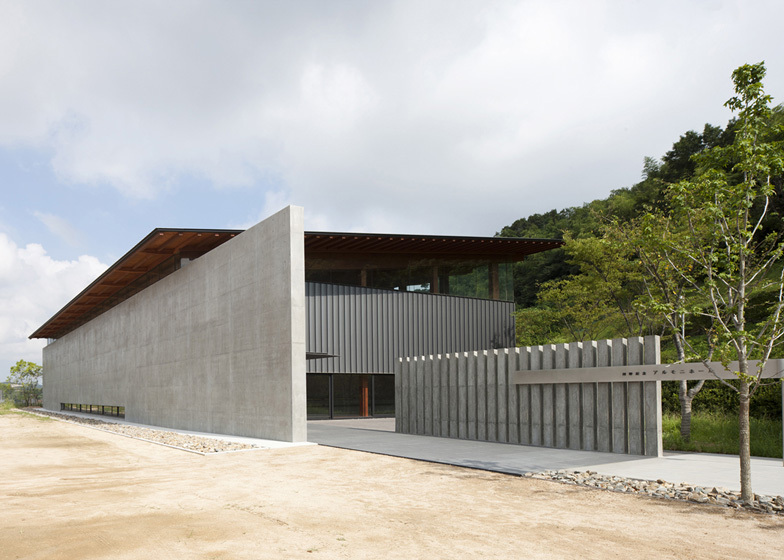 The context for this project was a combined junior and high school located in the peaceful hills overlooking Suma with a view of the Akashi Straits and Awaji Island. This school was established in 1992 with aims to foster women with prolific knowledge and grace, and the campus has since been designed with the theme that the campus has made an impression on their memory. The exposed concrete of the design provides a sense of integration with the campus which includes many memorable places. The existing school buildings, located on the north-south and east-west axes, consist of just two basic geometric shapes, the square and the circle, and were built of exposed concrete. This prompt for this project was to build a gymnasium the size of a basketball court for the 20th anniversary. For this project, I tried to create a new gymnasium, on the angle shaped site located in the west part of the campus, that was in harmony, to the greatest degree possible, with the surrounding environment. The junior high school building has a circular hall in the centre which is surrounded by open related rooms. This memorable hall within the square shaped form is inserted into the hill, but for this project I aimed to create memorable places between this building and the hills.